TOPEKA – Thousands of vehicles will be traveling the Kansas roadways during the Labor Day weekend. Many families will head out on one last camping trip or getaway as the school year begins. State safety officials and other volunteers are encouraging families to buckle up and drive safely to protect their most valuable asset, their families. Started Sunday and continuing through Sept. 6, a safety belt awareness campaign called “Bucks for Buckles” is being held in 43 cities across Kansas. One dollar bills are being distributed by local volunteers to drivers who have all occupants buckled up securely in their vehicle. Those riding unrestrained will receive educational materials about the effectiveness of seat belts and child safety seats in saving lives and reducing injuries. 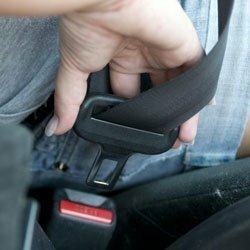 According to the 2013 KDOT Kansas Department of Transportation Seat Belt Survey, only 81 percent of those surveyed were wearing their seat belts. This compares to the national average of 87 percent. In 2013, Kansas ranked 40th in the nation in seat belt usage. An average of 92 people die each day in motor vehicle crashes nationally; that’s an average of one death every 16 minutes. For more information about safety belt or child safety seat use, call 785-296-1223 or visit www.safekidskansas.org. Photo: Center for Disease Control and Prevention.